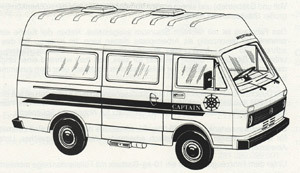 Circa 1978 the VW Westfalia LT Captain model was introduced. 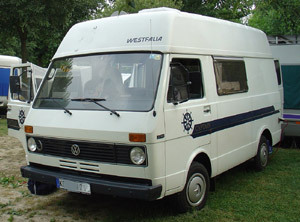 At around the same time another better equipped model called the VW Westfalia Sven Hedin was also introduced. 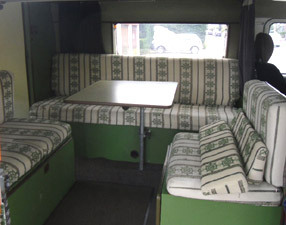 The Westfalia Captain model used the same high top as would be fitted to a standard Volkswagen LT van (whereas the Sven Hedin had a high top designed specifically for the camper version) and also the interior layout and specifications were different as can be seen below. 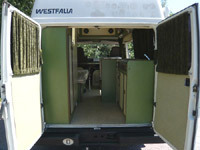 The VW Westfalia LT Captain Camper was initially available in 1 colour. The seating arrangement can accommodate 5 people. Continuous rear bench seat and two individual seats behind the driver's cab. There is sufficient storage space for linens, towels, sweaters, and shirts in a convenient arrangement. 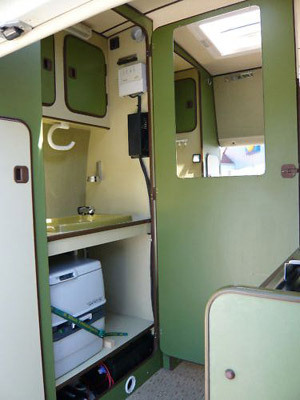 The 1980 Volkswagen Westfalia LT Captain camper had furniture with a dark green shell with light green doors and openings (look beige in photos but brochure says light green?). 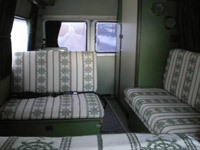 The upholstery in the VW Westfalia LT Captain camper was beige with green decoration. 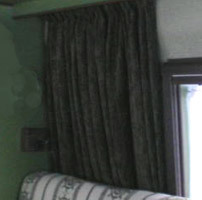 The curtains in the VW Westfalia LT Captain camper were dark green. 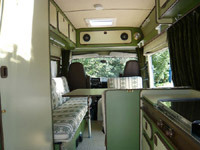 The high top roof on the VW Westfalia LT Captain camper was the same high top roof as the one used on the standard VW High room panel van. The inside height of the vehicle was 183 cm. Two insulated lifting air vents each fitted with mosquito nets. 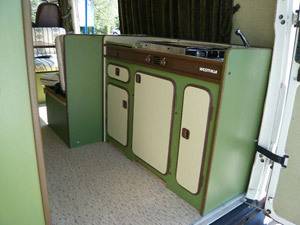 The flooring in the rear of the VW Westfalia LT Captain camper was a brown beige PVC lino material. 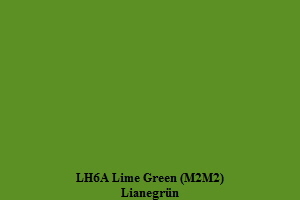 Door trims - brown vinyl. Tinted, heat insulating and double glazed plexi glass windows in rear living area. One opening window. 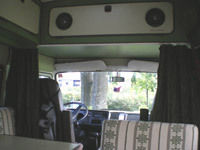 Curtains all round for the living and cab area. 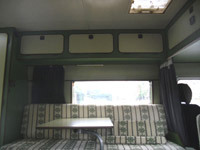 The spacious living / bedroom is equipped with a longitudinal bench 190 cm wide on the left hand side behind the driver's seat. On the right side i.e. 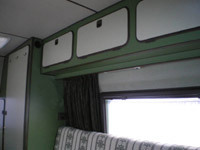 right and left of the sliding doors there are two single seats equipped with lap belts. The table is in the middle of the aisle and bolted to the longitudinal bench by a swivel bracket. The table is 72 cm x 63 cm and the surface is made of beige Getalit laminate. 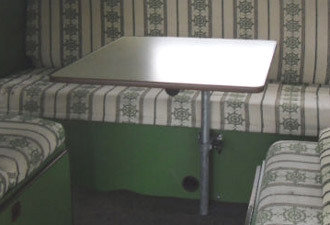 For sleeping the table top is removed and placed on the flaps between the two individual seats. The longitudinal bench is equipped with original Westfalia snap fittings and by simply lifting the seat the bed is formed. 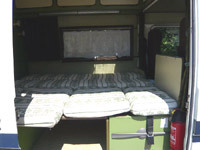 The backs of the single seats are lay next to the table and the whole area becomes a double bed of 190 cm x 184 cm. 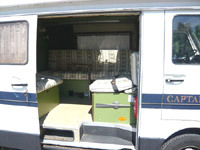 Another child bed of 160 cm x 100 cm can be installed in the cab (optional). At the rear right is the kitchen combination with two flame gas cooker, large sink, a cutlery draw, fridge and large supply cupboard. 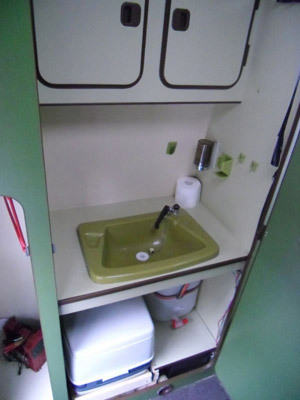 In photo small cupboard is equipped for gas bottle but not sure if the gas fittings have been added at a later date as brochure states this model had underfloor LPG tank as standard? 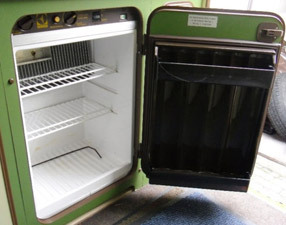 45 litre fridge working from 12v, 220v and gas. Storage space is plentiful in the vehicle. Above the kitchen there are two cupboards suitable for crockery etc. Rear left there is a large wardrobe, 30 cm wide x 180 cm high. 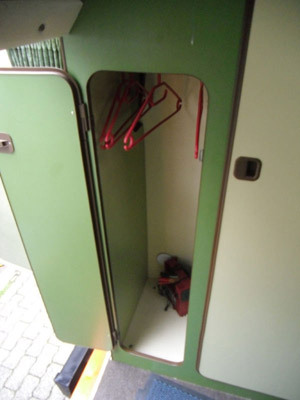 A linen closet, many overhead storage bins and storage under the seats offering plenty of space for clothes, shoes, sporting goods, grocery stores etc. 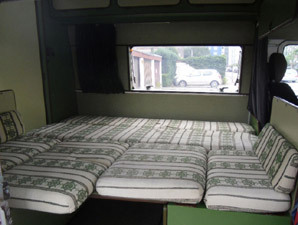 For the bedding there is a large storage area in the high top roof above the drivers cab. 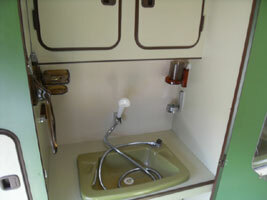 The large wash room has a wash basin, a water tap, mirror, toilet cabinet, shelves, hand towel holder, transistor light and a place for a portable toilet. For the washroom and kitchen a 13 litre water canister with electric pump is installed. External underbody 10kg LPG tank with fuel level gauge. 220 Volt external hook up with two internal outlet sockets and safety trip cut out. 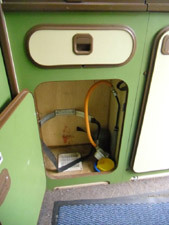 12 Volt circuit with 80 Amp leisure battery with split charge relay and automatic battery charger to power transistor lights, the water pump and the heater fan. The side walls of the living room and the roof are insulated with 40 mm thick non-flammable mineral wool.. The insulation is strongly glued to the body. The roof and side wall panelling are plastic coated. Under the floor there is a 10 mm thick Bitumen insulating board. 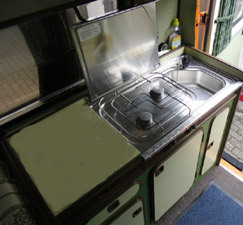 In conjunction with the optional padded and quilted curtains and with the heating switched on the Captain can remain fully operational at temperatures down to -15 C.
The flooring is a durable PVC in a colour that matches the furniture. 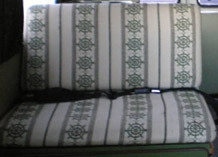 The original Volkswagen seats with upholstery in velour material. M025 Clock and speedometer with resettable mileage trip. M050 Dual circuit and hand brake warning light. M162 Rubber profile strip in front and rear bumpers. M184 Three point automatic (inertia reel) safety belts for driver and passenger. M208 Towbar with ball type hitch. M227 Detachable head rests for driver and passenger seats. M305, M310 Additional sound proofing for petrol engine model. M305, M310, M596 Additional sound proofing for diesel engine model. M561 Quarter light windows in front cab. M596 Water trap for diesel engine. M656 Height adjustable drivers seat. 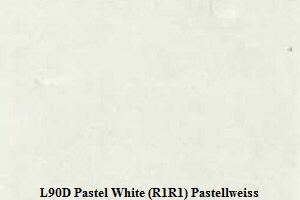 R02 Radio Braunschweig MW, UKW. R03 Radio Emden MW, UKW, Push button stations. Front Spoiler. Order number - ”on request”. 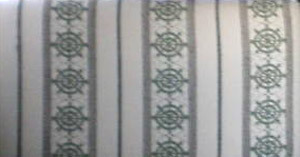 Cable roll with 40 m cable and connection cable. - Order number - ”on request”. Fire extinguisher 2 kg. Order number - ”on request”. 4 Loudspeakers with balance control. Order number - ”on request”. Pair of roof bars for sports equipment. Order number - ”on request”. Surfboard attachment for 1 surfboard. Order number - ”on request”. 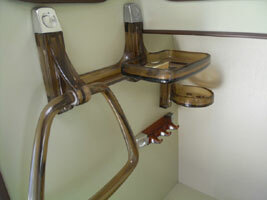 Ski attachment for 2 pair ski’s. Order number - ”on request”. Kayak attachment for 1 kayak. Order number - ”on request”. Attachment for 2 cycles. Order number - ”on request”. Sept 1979 VW Westfalia LT Captain Camper Sales Brochure / Pricelist Prospekt (4 Pages Black and White). March 1980 VW Westfalia LT Captain Camper Sales Brochure Prospekt (4 Pages Black and White). October 1980 VW Westfalia LT Captain / Sven Hedin Camper Price List Preisliste (6 Pages Black and White). Jan 1981 VW Westfalia LT Captain / Sven Hedin Camper Price List Preisliste (6 Pages Black and White).